That’s the name of the cooking class venue on New South Wales’ Central Coast, where I cooked last night. 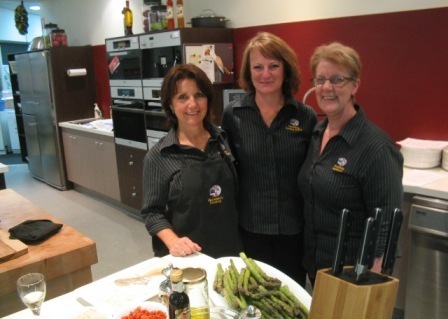 The beautiful hi-tech kitchen is part of World Wide Appliances, a massive kitchenware emporium situated at Erina Fair, the largest single level shopping centre in the Southern Hemisphere. This was our crew for the evening. 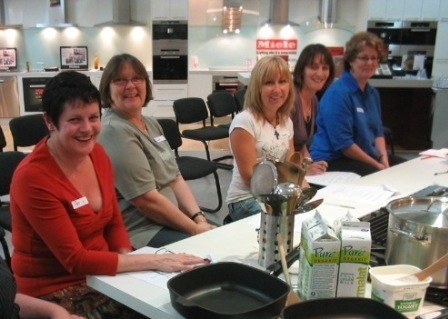 Sue and Mary, left and centre, were the mainstays of the kitchen. 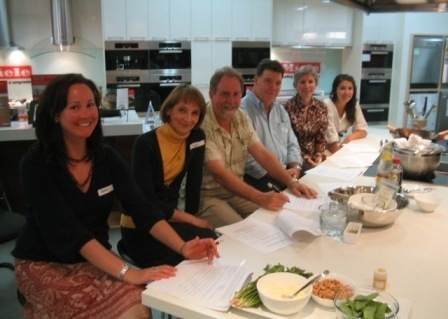 I have cooked with Mary, the cooking school manager and my host, on many occasions before, when she was assisting at Canberra’s Cooking Coordinates in Belconnen. Here’s half the students, poised to commence our demonstration-style class. We decided the casual seating, up-close to the preparation tables, suited well the relaxed evening.